UCLA is mandating a class in Diversity or Ethnic Studies for students, Fox News claims it is a front for Leftist propaganda. Whites are NOT the majority? GASP!!! Recently, UCLA faculty voted 2 to 1 to mandate a class on diversity for all its students. Is this really necessary? Fox News sure as hell doesn't think anyone needs to have empathy for other people, especially those who don't look or sound like the average white viewer of the "news" network. 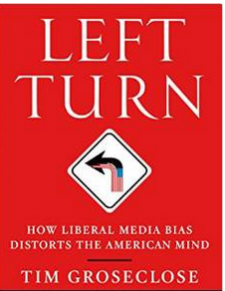 The foremost authority on why a liberal-leaning education is such a terrible thing is also the author of Left Turn: How Liberal Media Bias Distorts The American Mind. Naturally, this is the go-to guy for Steve Doocy to analyze why tolerance is so overrated. Current George Mason economics professor and former UCLA professor (of 11 years) Tim Groseclose has all the answers. The object of this segment was to show that "diversity" is code for left-wing propaganda. Is there any evidence of racism? Professor Groseclose, who taught at six different universities, explains that there's been literally no racism, except for that one time...A black surgeon had his face superimposed on the body of a gorilla. Even Groseclose admits that was racist. 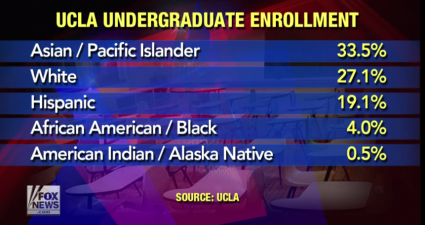 But hey, seriously, California is only 5-6% black, and UCLA essentially reflects that, so how could there be racism? The demographic breakdown above proves that there's no need to study other cultures or ethnic groups. It's just not necessary when you have so many Asians and Hispanics for tolerance to be taught. Notice the absence of Middle Eastern students? That's something of which no one should have any tolerance. Just ask Todd Starnes.